Try this healthy, delicious, grain free granola for your breakfast, snack, or on-the-go treat! 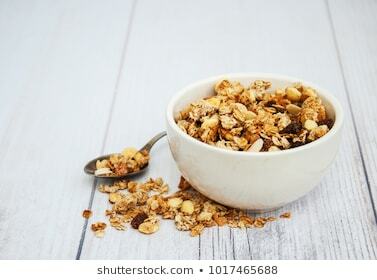 While store bought granola receives criticism for having extra sugar, this home-made granola recipe diminishes that with all healthy ingredients. Loaded with seeds, nuts, and crispy coconut, this granola is high in Omega-3 , antioxidants and protein. You can top your favorite Greek yogurt or even eat alone as a snack option. 2.Combine all ingredients in a large bowl, stirring until all ingredients are well combined. 3. Line large cookie sheet with lip with a sheet of parchment paper. 4. Spread mixture evenly in pan. 5. Bake for 20n minutes, turning and stirring mixture every 5 minutes. 6. Reduce oven temp to 325 and bake another 5 to 10 minutes, continuing to turn and stir mixture every 5 minutes, until nuts are toasted and mostly dry.